Home » Cache management » I have tested a 700MB downloaded file but it is not cached ? I have tested a 700MB downloaded file but it is not cached ? 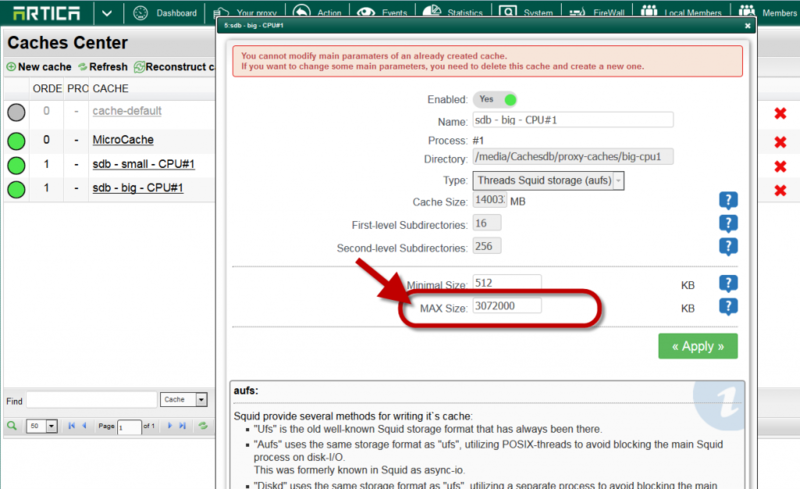 The proxy limit the size of objects that can be cached and 700MB is not added by default. 1) Check the Max Size value of your caches. Open a cache you will see the “Max Size” value, the Max Size value limit the size of one object to be stored on the cache system. In our example we have set a limit of 3 072 000 KB ( 3Gb ). A file more than 3GB will be refused to be stored on the cache system. 2) Check the size of your cache. If you cache is used and filled at 99%, you have no enough free space to store the object and the file will be refused to be cached.